Both the literal and the figurative definition are appropriate if you want to understand the concept of becoming a Cornerstone Member in this project so crucial to the future of Ridgefield’s growing city. A cornerstone is “the chief foundation on which something is constructed or developed.” No building (or concept) could stand without a solid foundation. A cornerstone (same source) is also “something that is essential, indispensable, or basic.” Without certain fundamental elements, certain things are simply not possible. We need to raise a great deal of money to build the technologically sophisticated, amply spacious, and sufficiently supplied library of the future. Fundraising events have been planned, are happening now, and will be planned for the duration of this project. But larger infusions of monetary support help to augment our grassroots fundraising efforts and help bolster our confidence and excitement. That’s where the Cornerstone Membership Program comes in. 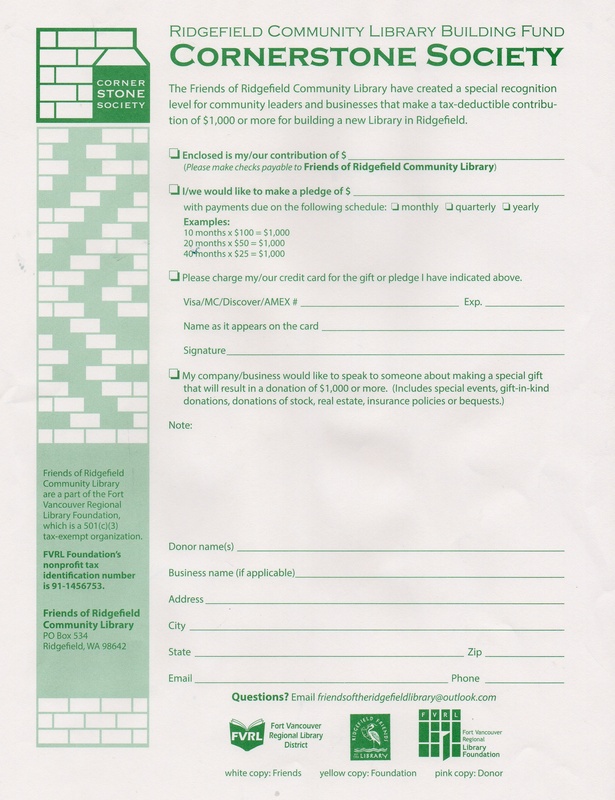 To become a Cornerstone Member, you donate a tax-deductible gift of $1,000 (or more) to the Friends of the Ridgefield Community Library. We, in turn, give that money to the FVRL to hold in our special “building reserves” account. You can give the entire amount in one lump sum, or spread payments out over time. You can use a credit card, debit card, or check. Cash will do, too! You can give it in your name, to honor a loved one, or to commemorate your entire family or organization. In recognition of your generosity and support, a placard with your name (or the name you designate) will be showcased in the new Ridgefield Community Library. Tell Us Why Libraries Are Important to You or Whatever is on Your Mind! We will get back to you and answer any questions that you may have.